ODU announces the successful expansion of its contact technology portfolio. 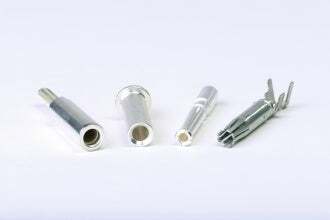 ODU’s four single-contact types, ODU SPRINGTAC, ODU LAMTAC, ODU TURNTAC and ODU STAMPTAC, are ideal connector solutions for a wide range of applications that can benefit from their technologies. ODU head of automotive Richard Espertshuber said: "Each of them lays the foundation for secure connections." The ODU SPRINGTAC technology boasts remarkable durability with more than 100,000 mating cycles with individually suspended springwires that offer a high number of contact surfaces even in small diameters. The ODU LAMTAC contact consists of a lathe-turned carrier in which one or more stamped lamella strips are inserted. The stamped lamella band ensures high contact reliability and optimum conductive properties. The slotted ODU TURNTAC is extremely robust and features four contact surfaces between pin and socket. Therefore, if plugged in at an angle up to 5°, this connector will still function reliably. The newest member of the ODU family, is the ODU STAMPTAC, designed for use in IEC charging plugs. The contact parts of the stamped contact, have a high process reliability, and they are ready for further automated processing. "With a high level of expertise in development and manufacturing of high-quality electrical connectors, we are constantly expanding our portfolio," Espertshuber added. "In doing so, we test new economical materials and surfaces while retaining high electrical conductivity." For further information on ODU and its contact technology series please visit the company website.